By this time tomorrow, The Legal Genealogist will be standing in Pearl, Mississippi. Pearl. On the Pearl River. In Rankin County. Where my third great grandfather once rode circuit as a Methodist Episcopal preacher and where he was one of the original county commissioners. But that’s a story for another day (and I’ll be telling part of it to the Mississippi Genealogical Society at its seminar tomorrow — come on out and join us! Walk-ins are welcome at the Clyde Muse Center, Hinds Community College, Rankin Campus, in Pearl, with doors opening at 8 a.m., tomorrow, Saturday!). Today’s story is of another Rankin County resident… someone who would have smiled to read one particular statute that appears in that old book I’ve been poking around in this week. You notice the underlying issue that’s key to this, right? You did note that no person could be a lawyer in Mississippi unless he be a citizen, and if approved the court shall give to him a license. Male pronouns. Male lawyers. Male court, for that matter. And it wasn’t until 100 years ago this year that that changed. And it was changed by a woman from Rankin County. 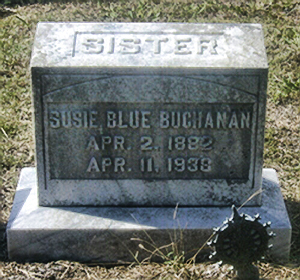 A woman named Susie Blue Buchanan. Image: Courtesy of Gwen Langley Pittman. I’ve been told that Alabama had to change the law so that my distant cousin, Miss Maud McLure Kelly, could be admitted to the bar. Alabama did rewrite the bar admission requirements. Not sure it was exclusively for Ms. Kelly’s benefit, but she certainly was the first to benefit from the change. Can you imagine the prejudice this woman faced. Learning and practicing the law was the easy part of for this woman. She must have been an exceptional person to walk among the “good ol boys” and hold her own. My hat’s off to you Susie Blue Buchanan! I’ve spoken to women who practiced in my lifetime who faced amazing hurdles, Stan. So for her to have overcome this so early is truly wonderful.